The Serving Tag page displays all serving tags. 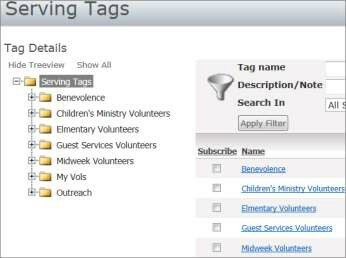 Use serving tags to manage volunteers in your organization such as guest service workers and children’s ministry volunteers. You can add existing records directly to a serving tag, from individual person detail page or on the Add Volunteer page under Volunteer Tracking. 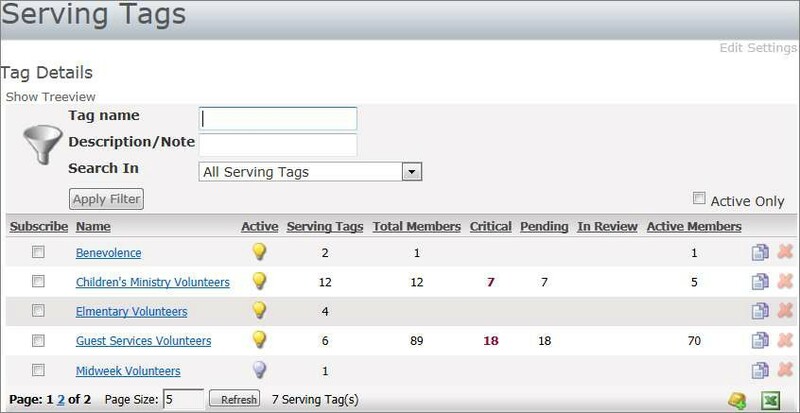 When adding directly to the tag, records have the default status of “Connected.” When adding from either the Add Volunteer page or an individual record, you can specify the status. Using Tag Status makes it easier for staff processing prospective volunteers. Additionally, customize Tag Statuses to fit your existing process. •Make sure that the ArenaProcessCriticalServing agent job is set up with the necessary settings. •Customize Serving Reminder System Email. The EmailFromName and EmailFromEmail and ReplyToEmail should be legitimate email information. Subject is required. •Arena URL should be the URL to get to Arena so that it can put a link in the email. •ProfilePage should be the page number for the page that you would go to in order to see the Tags (usually 25). •PersonProfilePage should be the page number for the page that has the Profile Member Details module to see the detail of the individuals in the tags (usually 26 is default). •Make sure that the ArenaMailQueue agent is also set up. •Make sure that they can send emails from Arena using communications. •Make sure that they can send emails "from" the same "from" email address that is set in the ArenaProcessCriticalServing agent job (check the log to make sure that they are not getting a relaying error). •From the Administration menu, click the Lookups option and go to the Tag Member Status and check that the values that should trigger a reminder email are marked "y" in the Include as Critical column (note: it HAS to be "y" not "1", not "true", etc.). •Make sure that the person that they are expecting to see the reminder about does have a red flag and is marked with either "no contact" or one of the statuses in the lookup that are marked to include in critical (see above). •From the Administration menu, click the Organization option to check the setting for WarningProfileDays a person is set to yellow after the number of days in WarningProfileDays if no contact has been made. •From the Administration menu, click the Organization option to check the for CriticalProfileDays a person is set to red/critical after the number of days in CriticalProfileDays have passed if no contact has been made. There is no system email for this; the agent has programming that writes the email. •The email goes to the owner of the tag. Make sure that the tag has an owner. •The email goes to the email address(s) on file for that person on their record in Arena. Make sure there is an email address on that record. •Customize the Add Profile Member module on the Add Volunteer page to designate a default member status as users enter prospective volunteers. •Customize Critical Profile Days and Warning Profile Days Organization Settings and start the Process Critical Serving agent. Once settings are in place, Arena sends an email to serving tag owners when the status of a prospective volunteer in a Serving Tag has not been changed in the number of days as specified in the Organization Settings. You need to add a valid Arena URL (e.g., http://arena.church.org/) to the Arena URL field in this agent. •Customize the Volunteer Signup System Email that is sent to prospective volunteers when the individual signs up on the Arena-managed website or a staff member uses the Add Volunteer option. 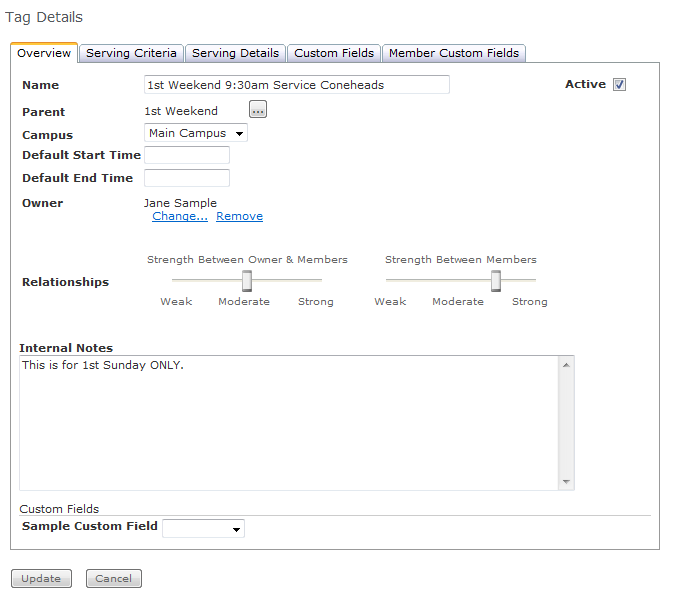 •Customize the Serving Reminder System Email, start the Serving Reminder Agent and add future occurrences to applicable Serving Tags to use the option to email volunteers when they are expected to serve next. Emails are sent to connected tag members according to the occurrence date. •Customize Tag Member Status Lookup. Use the Include as Critical “y” indicator for any existing or new status you want to trigger an email notification to the tag owner of prospective volunteers via arena-managed website or Add Volunteer. Keep in mind Connected, In Process and No Contact statuses are in use by other modules and settings. All other tag statuses apply only to Serving Tags. Critical and Warning are based on the Pending status. Review Tag Status is only applicable to Serving Tags. •Filter area: Use the Tag name, Description/Note and Search In drop-down to search for a specific serving tag. Click the Apply Filter button to execute the search. •Active Only: Select this check box to display only active tags. •Name: Click a Name link to display the tag. The default tag is the Parent Tag. •Active icon: The Active icon indicates active tags. An Inactive icon indicates inactive tags. •Serving Tags column: This number represents the number of tags under the tag. •Total Members: This number represents the total records in all tags regardless of status. Total number includes the current tag and any tags under the current tag. •Critical: This number represents registrants with a critical status. Critical status is dependent on the Warning Profile Days and Critical Profile Days Organization Settings. See your Arena Administrator. •Pending: This number represents new registrants. •In Review: This number represents registrants flagged as in review. •Active Members: This number represents all active registrants. •Copy icon: Use this icon to copy a tag. •Delete icon: Use this icon to delete a tag. You can delete tags at the lowest level on the tag tree. •Add Page icon: Use this icon to add a tag. 1. From the Tags menu, click the Serving Tags option. 2. Click the Add link if this is the first Serving tag in your system or click the Add New Serving Tag icon on the bottom right-hand corner if you have existing tags. 3. On the Overview tab, enter a Name. 4. Select Campus, if applicable. 5. Enter Start and End time, if applicable. 6. Click the Change link to change the owner, if applicable. 7. Adjust Relationship strength, as desired. 8. Click the Serving Criteria tab. 9. Enter and select criteria, as desired. 10. Select the Display to Public check box to display this serving opportunity on your Arena-managed website. 11. Select the Category Level check box to make this tag a category by which to filter serving tags. Arena displays all child tags of the current tag that are set to display and available positions. 12. Select the Critical Need check box to denote if this tag is a critical need. If selected, the tag displays on the initial Serving Opportunities page of your Arena-managed website. 13. Enter the Default Hours/Week for this serving position. If hours are set to “0” this could affect lists that you search by the number of hours someone is serving. 14. Enter the Volunteers Needed for this serving position. This is applicable for Serving Tags you want to make available on your Arena-Managed external portal. 15. Enter the name of the contact person in the Contact Info field. This name displays on your Arena-managed website. 16. Enter the email address of the contact person in the Contact Email field. This email address displays on your Arena-managed website. 17. Enter the file path to promotional or training video in the Video link field. 18. You can upload a Category Photo to display on the Volunteer Opportunities page of the member portal. This photo displays when the tag is marked Category. 19. You can upload a Serving Photo to display with the Serving Tag on the Arena-managed Serving Opportunities page. 20. Select the Ministry Type. 21. Enter the Start and End Dates for this serving position. 22. Select Commitment Level, Weekly Commitment, Timeframe, Classification, Content Category, and Duration. These criteria allow website users to search and select a serving opportunity. You must select a Content Category for the serving opportunity to be available on your Arena-managed website for registration purposes. These options will vary. See your Arena Administrator regarding customization for your organization. 23. Select the Serving Details tab. 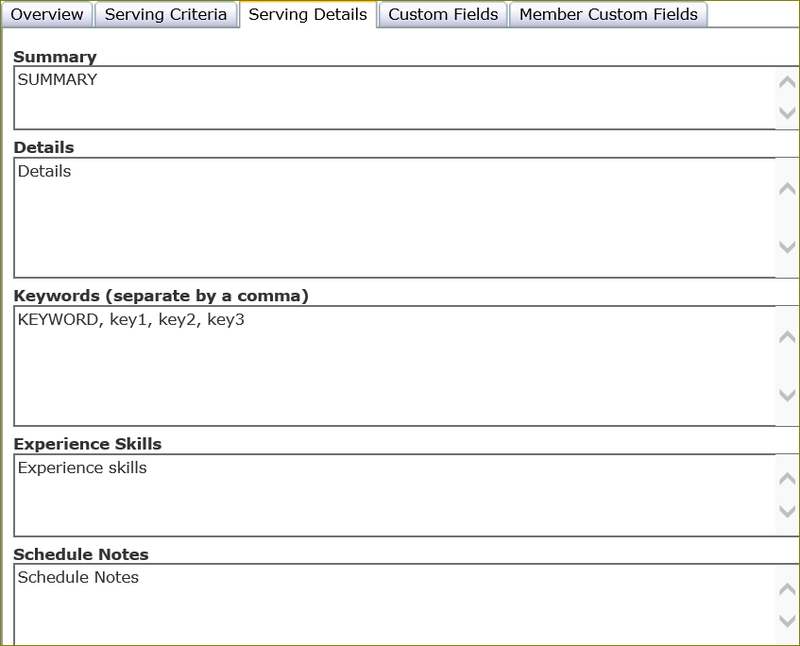 Summary, Details, Experience Skills and Schedule Notes display once the prospective volunteer selects the position. 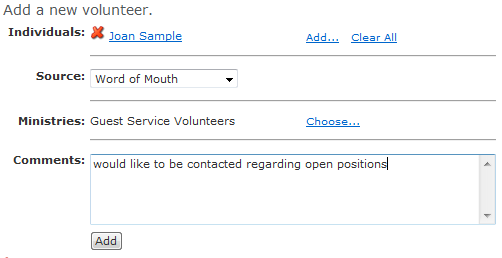 Prospective volunteers can also enter keywords that can be used. 24. Click the Custom Fields tab to create custom fields. 25. 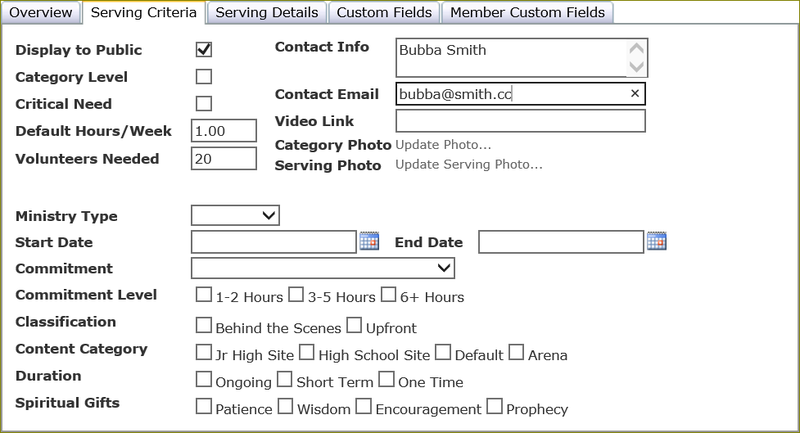 Custom fields you elect to Show on List display on the Serving Tag page. 26. Click the Member Custom Fields tab. 27. Add custom fields, as desired. See detailed instructions in the Ministry Tag section of this help file. 28. Click the Update button. 2. Click the Add Person icon. 3. Use the Person Search box to search for the record. 5. The Tag Member page displays. 6. Use the filter boxes to display the record. The default tag status is Connected. 1. From the Volunteer Tracking menu, click the Add Volunteer option. 2. Click the Add link to search and select for the existing record. 3. Select the Source, to identify how the person became aware of the serving opportunity. The Source option is a customizable Lookup. See your Arena Administrator for more information. 4. Click the Choose link to search and select a Serving tag. 5. Enter Comments, as desired. 6. Click the Add button. Arena adds the person to the tag, with the default status of In Process. On the tag page, you can sort by any single column. Click a column heading to sort in ascending or descending order. On the tag Members tab, you can filter members by status. Tag status options may vary. Arena marks all “No Contact” status records with a yellow/red flag, based on the Critical Profile Days Organization Setting value. •No Contact - This is the default status applied to new prospects. You should contact the prospect within one week. Once you make contact, you can change the status to ‘In Process’ or whatever is the next step in your organization’s process. •In Process - This status applies to contacted prospects; the person’s response is pending. •Background Check Pending - This status is used for prospects who have committed to serve, but must have a background check approved before starting to serve. •Unable to Serve - This status is for prospects that are not able to serve in the ministry for which they originally volunteered. When changing the status to ‘Unable to Serve’ you must provide a reason. The volunteer coordinator reviews these prospects and removes them. •No Response - This status is for prospects who do not respond to your efforts to contact them. •Already Serving - This status applies to prospects who tell you that they are already serving when you contact them. Be sure to record where the prospect is serving in the reason field. The volunteer coordinator reviews these prospects and removes them. •Place Elsewhere - This status is if the prospect wishes to serve in a different area. •Connected - This is the default status when you add a record directly to the tag. •Inactive – Use this status to identify a volunteer as inactive. For example, if there is a volunteer on your team who is taking a month’s vacation change the person to inactive. When the person returns update him back to active. If your organization uses online volunteer registration, this also creates an opening for this position. 2. Click the Show Treeview link. 3. Click the Expand icon to expand the tag tree.